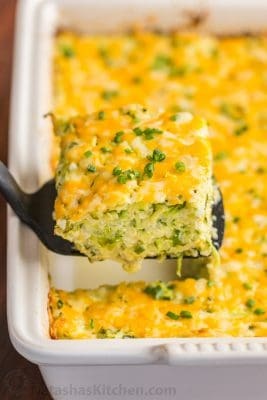 A golden cheesy crust seals in the fluffy, moist and creamy center of this zucchini casserole. This zucchini casserole recipe is easy, irresistibly delicious and a great way to use up extra garden vegetables! Prep: Preheat oven to 400˚F and butter a 9x13 casserole dish. Grate zucchini on the large holes (or the grating attachment on a food processor). Transfer grated zucchini to a colander over the sink and stir in 1 tsp salt. Let stand 10 min, stirring a couple of times then squeeze out the excess moisture with your hands. Transfer drained zucchini to a large mixing bowl. Mix 2/3 cup sour cream with 1/2 tsp baking powder and let stand while zucchini drains (8-10 min). Into the mixing bowl with drained zucchini, stir in 4 eggs and sour cream mixture. Pour mixture into buttered casserole dish and spread 1/3 cup sour cream over the top. Sprinkle remaining 1 cup cheese over the surface and bake uncovered on the center rack at 400˚ for 40 min. Let stand for 10 min before serving. *To cook rice for this recipe, you will need 1 cup of uncooked rice.